The Eagles have work to do, but they came out healthy. The first-team units were without eight probable starters. The top two quarterbacks were sidelined. There were a few other key missing pieces. And the preseason is, ultimately, about evaluation. But the Eagles made far too many mistakes for Doug Pederson to be pleased. They had three turnovers, 11 penalties and too many missed tackles. They have a lot to clean up, but they have time. The coaches will watch the film and make corrections. It's a cliché at this point, but avoiding major injury was a win. Cornerback Sidney Jones said he suffered a lower ankle sprain. I saw a few others with bandages and iced limbs after the game – center Isaac Seumalo was nursing an arm and defensive end Josh Sweat had his wrist in a wrap – but the injuries didn't appear to be significant. The starting defense was effective. For two weeks, Jim Schwartz's defense has routinely gotten the better of Pederson's offense in camp. Without quarterback Carson Wentz, wide receiver Alshon Jeffrey and a rotating cast of banged-up skill-position players, you would expect as much. But the defense carried the effort into the preseason and forced the Steelers' first unit to go three and out on its first two possessions. An important caveat: Pittsburgh rested its top three players: quarterback Ben Roethlisberger, receiver Antonio Brown and running back Le'Veon Bell. But the Eagles could play only the hand they were dealt and they dominated. Fletcher Cox dusted Pro Bowl guard David DeCastro and sacked Landry Jones on Pittsburgh's second play from scrimmage. Cox ran down a screen from behind on the next play. And a few series later, he walked backup center B.J. Finney into quarterback Joshua Dobbs, who threw short of the sticks just as he was hit. Safety Malcolm Jenkins and linebacker Nigel Bradham teamed up for a sack after a blitz. Linebacker Jordan Hicks didn't stand out in a good way or bad, but he assisted on a pair of tackles, and, most important, was back on the field after October's Achilles tendon rupture. Nate Sudfeld didn't make anyone forget Nick Foles. The third-string quarterback got the start and started slowly. He threw to a covered Greg Ward and was intercepted. It was a poor toss and an even worse read. Sudfeld acknowledged as much after the game. A few other early passes were a smidgeon late. He was indecisive. But he got better. He hit Dallas Goedert for 26 yards, then for 19 yards on a seam route, and then improvised and hooked up with the rookie tight end for a 15-yard touchdown. It was Sudfeld's best moment. He eluded an unblocked rusher off the edge. He scrambled, pumped, and hit the ad-libbing Goedert off script. Sudfeld later lofted a long-ball strike to receiver Shelton Gibson for a 63-yard touchdown. He tossed another interception, although it looked as if he and receiver Bryce Treggs got their signals mixed. Sudfeld is still a work in progress. He doesn't make Foles, who missed the game with a neck strain, expendable. Sidney Jones could stay in the slot. The Eagles appear to be invested in keeping the second-year corner inside. Jones stayed in the slot with both the first- and second-team defenses. That hasn't been the case in camp. He's ping-ponged back and forth between spots depending on the day. It's still early and maybe he ends up outside, but Schwartz likes Jalen Mills and Ronald Darby there. And it's hard to disagree. Those two have had strong summers. Jones will eventually end up outside, but he has the skill set to play anywhere. He did fine Thursday, but it wasn't the positive that stood out. He was flagged for leading with his helmet on a hit, and he injured his left ankle. Jones didn't seem concerned about the injury after the game, although it's the same foot in which he ruptured his Achilles last year. There's little reason to think that Schwartz will sway from his top three corners. Rasul Douglas has been effective in camp, and he made several strong stops against the Steelers – including jumping a route for a pick – but there were a few miscues in man coverage. He is on the roster, of course, but is unlikely to crack the starting lineup. The same goes for De'Vante Bausby, who covered well, but also missed an open-field tackle and had two penalties. Eagles running back Josh Adams carries the football against the Steelers. Give Josh Adams an early nod for the fourth running-back spot. The undrafted rookie has looked polished in camp, but we just haven't seen enough of him because of injuries. Adams' preseason debut offered a glimpse of his abilities. There's a naturalness to his running. He rushed six times for 30 yards and caught two passes for 11 yards. Adams isn't like the Eagles' other running backs. He's long and runs more upright. But it could be nice to have a change of pace after Jay Ajayi (4-20), Darren Sproles and Corey Clement (5-30). Wendell Smallwood had a 13-yard burst, but he also fumbled. He hasn't improved. Matt Jones and Donnel Pumphrey were out with injuries. They need to make up time. Adams didn't exactly set the world on fire, but his competition has been lukewarm. The Eagles would love to have a young tailback ready to assume a larger role next season with Ajayi likely to walk and Sproles set to retire. Adams is a long way from that projection, but he has promise. The weak-side linebacker spot is still up for grabs. Nate Gerry got the start, to no surprise. He's been the main guy in camp. He seemed to do fine. He got driven back by a guard at the second level on a long Steelers run, but that's bound to happen. I didn't particularly like his effort on a sideline pass. He had a chance to run a receiver down, but he eased up and got clobbered by a returning block. Gerry moved to the middle with the second unit. Kamu Grugier-Hill led the Eagles with six solo tackles – two for loss. He really has a nose for the ball. The Eagles seem intent on having Gerry, a former draft pick, win the spot, but Grugier-Hill has made more plays. It's now even more obvious why Corey Graham was brought back. It was always a foregone conclusion, but the Eagles might have pushed up Graham's return after just a few practices of watching Tre Sullivan as the third safety. He hasn't separated himself in camp and struggled against the Steelers. You can excuse the technical errors, but there was no reason for jogging after receiver Ju-Ju Smith-Schuster once he got by Douglas on a 71-yard touchdown catch. Graham, who re-signed with the Eagles on Sunday, didn't play. Undrafted rookie Jeremy Reaves flashed a few times against the run, but that's his strength. He needs to show that he can man-cover and offer help from over top. Isaac Seumalo can't snap. You play like you practice, and Seumalo has been torpedoing snaps over quarterbacks' heads throughout camp. I don't recall the shotgun ever being a problem for the third-year offensive lineman before, but he fired another over the head of quarterback Joe Callahan that killed a drive. Offensive coordinator Mike Groh said last week that Seumalo's bad snaps have come when he's trying to block at the second level. That wasn't the case Thursday night. He has blocked well in camp and was stout against the Steelers, but if he is to be the center of the future – nowhere near a lock – he must figure the snap out. I think he's a lock to make the team. The Eagles use him as their tackle-eligible sixth offensive lineman, and those plays are an integral part of the offense. Ajayi's 22-yard run came with Seumalo as the extra blocker. Eagles tight end Dallas Goedert scores a second-quarter touchdown past Pittsburgh Steelers linebacker Anthony Chickillo. Dallas Goedert can ball. The rookie tight end caught four of five targets for 66 yards and a touchdown. He blocked well — against linebackers and defensive linemen. 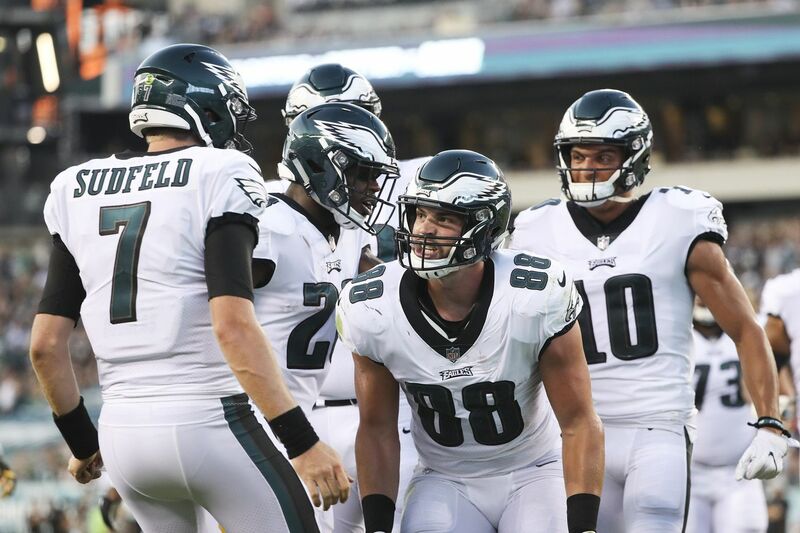 Zach Ertz's absence made him the No. 1 tight end, but Goedert is going to be a vital part of the offense. He dropped a pass, but he made the other catches look seamless. The Eagles' other rookie draft picks got lots of work. Cornerback Avonte Maddox was up and down. He is athletic and has instincts, but he made mistakes, too, and is learning. Sweat has obvious potential. He got off a block and made a tackle against the run. He also roughed the passer and negated a third-down stop. Guard Matt Pryor, as far as I could tell, transferred his excellent work in practice to the game. I have him on the roster ahead of Chance Warmack. Tackle Jordan Mailata allowed an early sack, but he had never played a football game in his life. He settled down. Mailata has been playing with a torn PCL. He could end up on injured reserve. And some leftovers: Cameron Johnston punted well. He averaged a 43.8-yard net and landed three kicks inside the 20. He had an 81-yard punt (!) brought back by a penalty. Johnson clearly has enough leg, but situational kicking will be the deciding factor. He could have done a little better on pinning the Steelers inside the 20. … Defensive tackle Elijah Qualls was flagged three times – twice for defensive holding. Not good. … Gibson's 63-yard touchdown was a highlight. He beat a corner on a straight go route. But he also looked good on kick returns, averaging 26.5 yards on two tries.